The 12-month forecast through May 2019 indicates intense water surpluses in Myanmar, Laos, eastern Cambodia into Vietnam, and northern Vietnam. Significant deficits are forecast for western Cambodia and Thailand. Deficits are also forecast in pockets throughout Malaysia, Indonesia, Philippines, and Papua New Guinea and are expected to be intense in northeastern Sumatra, Palawan (Philippines), and Papua New Guinea. The near-term forecast through November indicates that, though surpluses will shrink and downgrade overall, significant surpluses will persist in Myanmar and Laos. Surpluses will shrink and downgrade in Vietnam, transitioning to moderate deficit in the narrows of central Vietnam. Extreme to exceptional deficits will increase in the bulk of western Cambodia, and deficits of generally lesser severity will spread throughout much of Thailand. Deficits will increase in Malaysia, ranging from moderate to extreme, and downgrade in Java and Papua New Guinea. Moderate deficits are forecast for central Philippines, many pockets of Indonesia, and East Timor. Deficits may be more intense in Palawan (Philippines). From December through February surpluses will continue to retreat, leaving primarily severe surpluses in northern Vietnam and nearby regions of Laos. Intense deficits will persist in western Cambodia and into eastern Thailand, with moderate deficits spreading throughout the rest of Thailand. As transitions occur, both deficits and surpluses are forecast for western Myanmar, northern Laos, and eastern Cambodia. Deficits will spread in the Philippines. 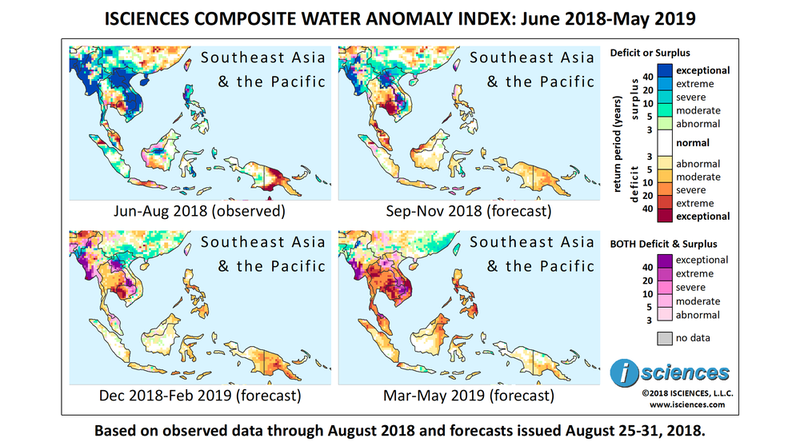 Conditions in Malaysia, Sumatra, and Borneo will approach normal, but moderate to occasionally severe deficits are forecast elsewhere in Indonesia. Widespread deficits will persist in Papua New Guinea and reach extreme intensity in the center of the country and in pockets of the Papuan Peninsula (Bird’s Tail Peninsula). The forecast for the final months – March through May – indicates that deficits will increase and intensify in Southeast Asia, the Philippines, Malaysia, and pockets of Indonesia, and downgrade on New Guinea. Almost five million people across 11 provinces in Indonesia have suffered water shortages since late July due to drought in the region. Some farmers on the island of Java claim to have gone four months without rain. Several villages are entirely dependent on government deliveries of water by truck, their wells having dried up. So far, the federal disaster agency has allocated 50 billion Indonesian Rupiah (USD $3.4 million) to supply water to the afflicted areas. Researchers in Vietnam have successfully trialed two water harvesters, designed to extract moisture from humid air, in an effort to address frequent droughts in the Mekong Delta. The devices provide drinking water to 680 students at a primary school in Phan Rang City and to researchers and students at Ho Chi Minh City’s University of Natural Resources and Environment, where the harvesters were developed. Drought is hitting farmers in central Myanmar this crop season, impacting the growth of monsoon paddy. In southern Myanmar, meanwhile, heavy rains threatened flooding last month. Thousands were displaced when monsoon rains broke through a spillway of the Swar Chaung dam. At least one person was killed in the flood. Flooding along the Mekong River killed 30 people across several provinces of Cambodia last month. Almost 100,000 families moved to higher ground as floods ravaged riparian farmlands. Eight other provinces, meanwhile, have been affected by drought conditions. Tropical Storm Bebinca (also known as Tropical Depression Fabian), one of a series of storms, hit the region last month. In Thailand over 150,000 people from 18 provinces were affected by flooding. Between Bebinca and July’s Tropical Storm Son-tinh, Laos suffered at least 55 deaths and damage to over 90,668 hectares (224,000 acres) due to flooding and landslides.